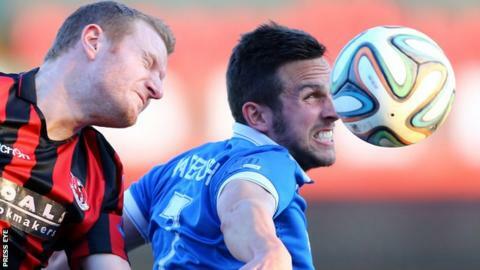 Premiership champions Crusaders hope to eat into Linfield's five-point lead at the summit when the Belfast rivals clash at Seaview on Saturday. Linfield have won all six of their league fixtures so far while the Crues have had four victories in a row. Defender Josh Robinson returns for Crusaders after missing the win over Cliftonville with a hamstring injury. David Magowan could be available after a back problem but front man Michael Carvill might still be out. This will be Linfield's biggest test of the campaign so far, but victory would see them firmly installed as early-season title favourites. Warren Feeney described the top-two clash as a great occasion, but added: "All games are big and we treat all of our opponents the same. "They are the defending champions and are at home and have been on a fantastic run, but we will have a game plan. "We want to play football and the boys are looking forward to it. "I expect a tight encounter but hopefully we will get the right result." Third-placed Cliftonville, like Crusaders, are five points behind Feeney's pacesetters and they travel to bottom club Ballymena United. After taking just one point from their opening five fixtures, Ballymena had a morale-boosting 3-1 win at Glentoran last weekend. Ballymena's Gavin Taggart and Tony Kane are available again, having been taken off the transfer list, but boss Glenn Ferguson expects to be without on-loan defender Gareth Rodger who has a hamstring injury. At the Oval, Glentoran host Portadown in the first meeting between the sides since the Glens won last May's Irish Cup final. Coleraine, who are fourth after their best start to the league in years, will aim for a fifth win of the campaign when they take on Glenavon at Mourneview Park.